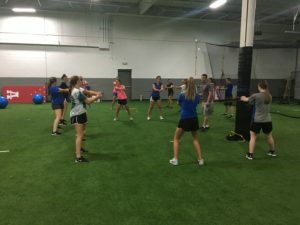 Team training is the best value we have for training athletes. Coach Nate writes up every workout and progresses the sessions based on movements needed to play that sport. Sessions are 60 minutes long. The primary emphasis is on speed work and footwork. Athletes will also work on strength training and conditioning as well based on the sports need. Call for available times, so we can plan the best time for your team!